What a great assortment of prizes for you! I love my 2 Red Hens bag, it’s perfect! And MAM products are some of the best for your baby! Tortle is a simple, comfortable beanie that helps prevent and treat early stages flat head syndrome: plagiocephaly & torticollis. It makes the job of repositioning newborns safe and easy. It is recommended that all newborns wear a Tortle for the first few months of life to aid in repositioning; which supports healthy development. Tortle works by gently deflecting your baby’s head when she’s sitting or lying on the back of her head, to gently move her head from side to side. 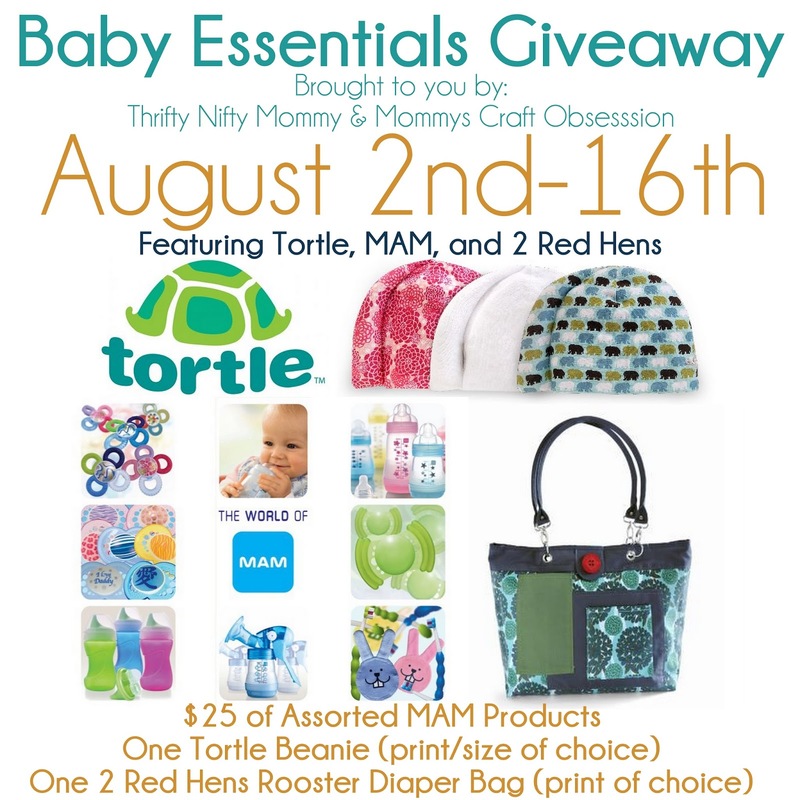 The Rooster Diaper Bag is the most popular bag from 2 Red Hens. To a passerby, the Rooster bag looks like a cute purse, but look inside, and you’ll see the functionality that every mom needs in a diaper bag. With an interior zipper pocket, bottle holder and 2 elastic pockets, organization is a cinch! And, never dig for your keys again with an attached key Fob for easy access! Other features include: removable stroller straps, magnetic snap & button for extra security, water-resistant backing for easy, wipe-down cleaning, & extra-long polka-dot changing pad (26″ x 12.5″). Behind each MAM innovation is a perfect combination of medical and technical expertise. Internationally recognized designers, medical professionals and developmental psychologists collaborate to develop safe and innovative baby products. For this reason, MAM’s mission is to provide babies with an optimal start in life and cool, easy style for their parents! At MAM you’ll find lots of great BPA-Free products including pacifiers, sippy cups, bottles, teethers, and more! This prize package ARV is $95! Open to the US only. Ends 8/16/13 at 11:59 PM EST. Disclosure: No compensation was received in exchange for hosting this giveaway. The participating bloggers are not responsible for prize fulfillment. MAMBaby Introduces Holiday Pacifiers Perfect for Baby’s Stocking Stuffers!